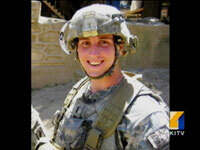 Jonathan Brostrom died Sunday in Afghanistan. 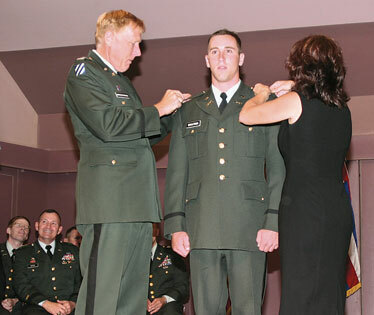 Here, he has his second lieutenant's bars pinned on by his father, David, and mother, Mary Jo, while his son, Jase, and brother, Blake, a member of the University of Hawaii's Army ROTC program, watch. Jonathan P. Brostrom was the kind of person who did the right and necessary thing, a Damien Memorial School teacher recalled yesterday. "The bottom line is in life we choose courses. In his life he chose to defend the U.S. He did what he believed was right for his country," said former biology teacher Mike Normand. Army 1st Lt. Brostrom, 24, of Aiea and eight fellow soldiers, scheduled to leave Afghanistan in a week, were killed Sunday in an hours-long attack on their remote outpost. Brostrom was the third University of Hawaii Army ROTC honor graduate to be killed in Iraq or Afghanistan. Brostrom, assigned to the 173rd Airborne Brigade Combat Team, based in Europe, had almost completed a 15-month combat tour. Army 1st Lt. Jonathan P. Brostrom, one of nine soldiers killed Sunday in the deadliest attack in Afghanistan in three years, was the third University of Hawaii Army ROTC honor graduate to be killed since the fighting began in Iraq and Afghanistan. 24-year-old Jonathan Brostrom's outpost near the Pakistan border was attacked by 100 Taliban fighters where he and 8 others died. Brostrom, 24, of Aiea, who graduated from Damien Memorial School in 2002, died defending a remote Afghan outpost. The soldiers were scheduled to leave Afghanistan next week, completing a 15-month combat tour. In a written statement, his father — retired Army Col. David Brostrom — said: "On behalf of my son and the entire Brostrom family, I would like to extend a special thank you to everyone for their kind thoughts, words, deeds and prayers. This is an extremely difficult time for us, and we are so thankful for the outpouring of support and aloha. "Jonathan will always be in our hearts — a proud father, a loving brother and a cherished son. He was our world, and we miss him more than words can express. "Jon was a Hawaii boy and a true patriot who gave the ultimate sacrifice for his country." The soldiers, assigned to the 173rd Airborne Brigade Combat Team's 2nd Battalion, 503rd Infantry Regiment, were killed when their outpost in Wanat was attacked by Taliban forces with rifles and rocket-propelled grenades. Fifteen U.S. soldiers were wounded during the attack. The Associated Press reported 200 fighters surrounded the soldiers' newly built base near the Pakistani border in Kunar province in northeastern Afghanistan before dawn without being spotted by the troops inside. A NATO official said they used houses, shops and a mosque for cover during the hours-long battle before American soldiers managed to drive out the attackers and call in support from attack helicopters. The official said dozens were killed and about 40 were wounded. Kurt Zwilling told the St. Louis Post-Dispatch that his son, Cpl. Gunnar Zwilling, said his company had received orders to build a new base for a fresh crop of replacement soldiers heading to the region to replace the airborne unit. The younger Zwilling was among the nine soldiers killed on Sunday. Yesterday the Associated Press reported that NATO said the remote outpost, which lies amid precipitous mountains, had been vacated, but insisted that international and Afghan troops will "retain a strong presence in that area with patrolling and other means." Two other UH Army ROTC honor graduates have been killed either in Iraq or Afghanistan. Army 1st Lt. Nainoa Hoe was killed by a sniper while on patrol in Mosul, Iraq, in 2005. Two years earlier, 2nd Lt. Jeremy L. Wolfe, 27, was piloting one of two Black Hawk helicopters that collided in Mosul, killing 16 other soldiers. Maj. Ed Leo, executive officer of the UH Army ROTC program, said Brostrom was in his senior year in the top 20 percent of the 4,000 university Army ROTC cadets enrolled in 270 universities. "He was one of the very rare students," Leo said, "who during the summers was able to graduate from the Army's air assault, airborne and dive school." Leo described Brostrom as "a good-natured kid who was very tough ... and a leader. If he had been on the football (team), he wouldn't have been the quarterback, but the linebacker." U.S. Sen. Daniel Akaka, in a written statement, said, "Lt. Brostrom served with courage and dedication and will be remembered with honor. We mourn his loss as we mourn the loss of all our servicemembers who have died defending this nation." Zwilling said his son's unit was scheduled to return home to its base in Italy in about a week. The first 500 soldiers assigned to six battalions of the U.S. Army Europe's only airborne unit returned to Italy last week. In June, Jonathan Brostrom's platoon was featured in a Stars and Stripes story. At that time the 2nd Battalion had conducted about 9,000 patrols during its 14 months in Kunar province. Fewer than one patrol in 10 result in troops engaging with enemy forces. The June 27 story said Brostrom and his platoon had about 15 major villages and dozens of smaller ones in their area of responsibility. Their mission that day was to visit a local leader in the village of Shalam to get information on the source of rocket attacks on their base, which was called Camp Blessing. Brent Limos, admissions director at Damien, described Brostrom as "a good student, hard worker. He was a very personable guy and made friends very easily. He was respectful to his teachers and administrators." Brostrom played golf as a Damien student and competed in tours held by the Hawaii State Junior Golf Association and the Oahu Junior Golf Association. His former golf coach, Jim Weicking, was shocked to hear of his death. "Jon was a great asset to the team. He was absolutely a fun-loving guy. He was a character," Weicking said. Brostrom's former biology teacher Mike Normand described him as a solid, hard-working student who had good leadership qualities. "He worked his tail off. ... He was a real honest kid," Normand said. He further described Brostrom as an outgoing person who had a team-player mentality. "It's sad that he died so young," Normand said. "The bottom line is in life we choose courses. In his life he chose to defend the U.S. He did what he believed was right for his country. That's the kind of kid he was, do what is right and necessary. He chose to do the right thing," he added. Brostrom also is survived by his mother, Mary Jo; brother, Blake; and 5-year-old son, Jase. His brother will graduate from the UH Army ROTC program next year, and is currently at Fort Lewis, Wash., at an ROTC summer camp. Star-Bulletin reporter Rosemarie Bernardo, the Associated Press and the Stars and Stripes contributed to this report.